A golf club loft angle and lie angle are very important attributes. Golfers can benefit from getting this checked and adjusted if necessary. The golf club manufacturers have slight variences of what constitutes a “standard” loft and lie angle for most golfers. Whether this factory standard is right for your individual swing is something all golfers need to have checked. At Better Golf Shot, we have the best Loft & Lie machine in the business. And our low prices for this task are no lie! LIE: $1.00ea club not needing adjustment; $2.00ea club that needs adjustment. LOFT: $1.00ea club not needing adjustment; $2.00ea club that needs adjustment. 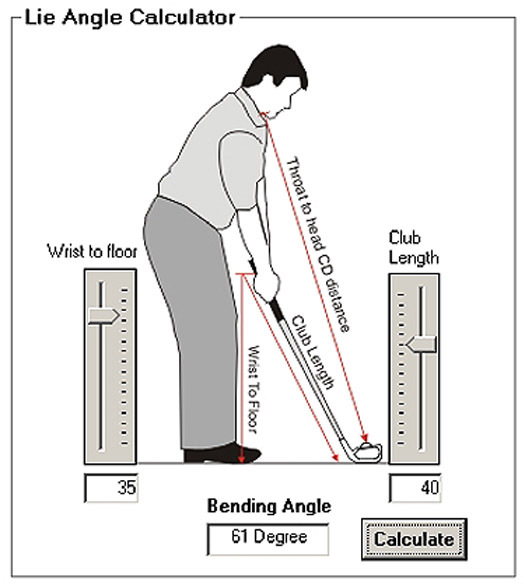 Lie is the angle from the shaft to the ground when the golf club is placed in a normal playing stance position. It enables the sole of the club head to strike the ground flat if it is correct. An incorrect lie negatively impacts your golf club performance. It will prevent you from making good ball contact. The club lie can be adjusted for a golfer that has a more upright or flatter swing. For unusually tall or short golfers, club lie is critical. When standing at address with a golf club, if the bottom of the club head is touching the ground more on the heel (lie too upright) or toe (lie too flat), the lie needs to be adjusted. If the toe of the club head is touching the ground, your shots will have a tendency to travel to the left or hook left (for a right handed golfer). In this case, you would require a lie angle adjustment (bending) that would lower the lie angle. Conversely, if the heel of the club is touching the ground, your shots will have a tendency to fly to the right or fade (for a right handed golfer). In this case, you would require a lie angle adjustment (bending) that would raise the lie angle. Loft is the angle of the club face that controls trajectory of the golf shot and affects distance. Stronger or weaker lofts can lead to higher, lower, longer, or shorter ball flights. The standard loft on manufactured golf clubs varies from brand to brand. Loft is considered to be more of an individual preference based on the desired ball flight. More importantly, the distance you want to hit the golf ball is also a factor. If you are struggling for more distance and also hitting the ball very high, you might want to consider an adjustment your loft. Golf clubs have varying degrees of loft, lower angles for the longer clubs and getting progressively larger for the shorter clubs. So, the shorter clubs have the most loft to allow hitting the ball higher. If you hit the ground regularly with your swing and take a lot of divots – you can actually alter the loft and lie on your clubs without even realizing it. Therefore, continually hitting out of the rough, off cart paths, and out of wooded areas can negatively alter the lie or loft. Also, if you spend a lot of time at the golf range working on your swing – hitting off a standard mat with concrete foundation can also push your loft and lie of a club out of sync with repeated use. Your clubs may actually develop gaps between stated lofts that will affect shot distance, trajectory, and accuracy. A putter head face should be square to the ball and flat at address through impact. Putters do have loft and lie as well that can be adjusted. Instead of going out an buying a new putter when dissatisfied with your results, try and have it adjusted and fitted. Therefore, you can improve your putting stats by having your putter adjusted to match your physical build and putting stroke. If the toe of the putter is sticking up in the air with the heel down, the tendency is to pull the ball slightly to the left (for a right handed golfer). Conversely, if the toe of the putter is down and the heel is up in the air, the tendency is to push the ball slightly to the right (for a right handed golfer). An incorrect lie angle will also cause a slightly less solid contact hit with poor energy transfer, hence making distance control more difficult. Your putter face does need some loft. It needs a bit of loft to lift the ball out of the shallow depression caused by the ball’s weight on the greens. But, too much loft can compromise distance along with directional control. The ball will tend to skid and bounce after impact. Conversely, too little loft can compress the ball into the turf with similar unwanted effects especially in wet conditions. The standard built-in loft of most putters is two to four degrees. The rule of thumb: Slow greens need more loft; Fast greens require less loft. These two key factors make a big difference with all clubs in making solid consistent ball contact. Most golfers buy clubs which are standard off-the-rack. However, there is no industry standard for club head loft and lie. Each manufacturer’s club design may very within this gray area lacking a set industry-wide standard. Furthermore, the majority of golfers have no idea about the importance of properly fitting loft and lie angles to their physical size and individual swing plane. We can check and adjust these factors to correct a club, or make a change to better fit your swing. We have the industry best “Bending Machine” . 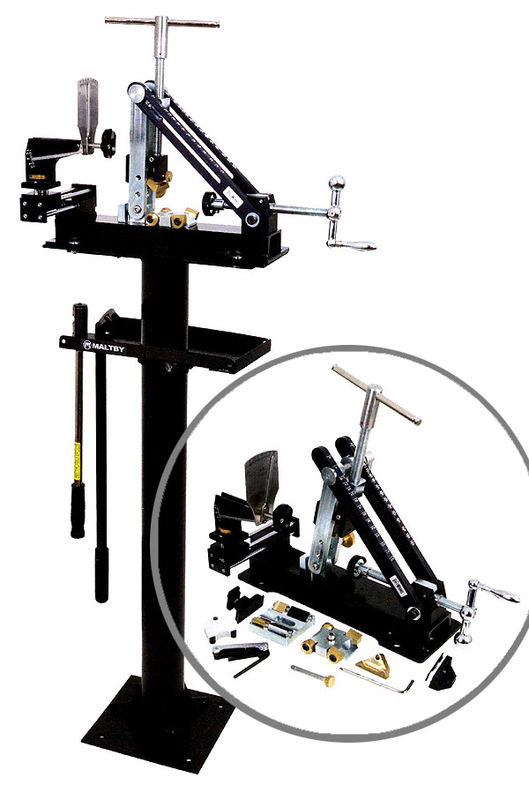 It can adjust woods, irons, hybrids, and putters with our many jigs – bending bars – and positioning blocks.